The challenge I was given by Dr. Gary Gates, International Business Director at ITIS Holdings, was to help him generate more business for ITIS Holdings outside their home UK market. ITIS provides traffic information – analysis of what’s happening on the road network. If you’ve heard radio traffic bulletins, used up-to-the-minute traffic information for rerouting on your satnav device, or called on your mobile phone to get information about the hold-ups on your way home, you may be unaware that there’s some very powerful data processing going on behind the scenes. ITIS gathers data from lots of sources and puts it through sophisticated analysis to generate information that we can all use in a lot of ways. Gary’s small team was working to develop relationships all around the world that would lead to companies licensing ITIS’ technology. Gary talks about the project in this short interview. The first thing I had to do was figure out what the obstacles to their success were; the second step would be to remove them. In talking to people in the team, it was clear that they didn’t have a single clear definition of what ITIS does. This often happens in technology companies, where people inside the company are relatively comfortable with the complexities of what they do. But from the outside, the picture needs to be very simple. And it was a picture that turned out be crucial. I turned all the information I gathered about the various projects and technologies that ITIS could deploy into a simple diagram of their software platform. Getting agreement on what should or shouldn’t be in the diagram took many discussions, and the final version was, I think, the seventeenth revision. The picture was backed up by a succint textual description of how the software operates. 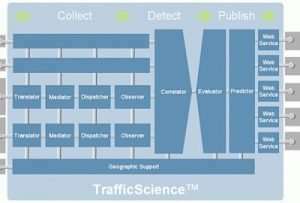 Having defined ITIS’ offering in this way, it needed a name, and I helped the various decision makers to come to a consensus on what it should be: TrafficScience. We’d reduced a complex story to one that was easy to communicate. With conversations happening simultaneously on all six continents, it was important that the message about ITIS was communicated consistently, and was easy for people to find. The existing ITIS website, built largely in Flash, was not performing well in searches. Nor did its style give a good impression of the company. A new website was needed. I project managed Silkmoth, who did the website development, and Axon Garside, who did the visual design. I brought in another associate, Penny Lines of No Nonsense Marketing, to work with me on the content for the website. She interviewed ITIS customers and business partners to produce case studies that illustrated how ITIS had helped organisations to be successful in every market sector that ITIS operates in. The new website set out a clearer story about ITIS. One that is easy for people to understand, wherever they are in the world. ITIS has been bought by INRIX, a company it both competed and collaborated with. He is an excellent advisor who can cut through detailed and complex problems to the core issues, with surgical precision.